Out April 2. Pre-order from Amazon now. Caught in the crossfi re, Earth has become the staging ground for a conflict of cosmic proportions. The merciless Kree and the shape-changing Skrulls have gone to war, and humanity is on the frontline. It's Roy Thomas and Neal Adams'classic Kree-Skrull War! 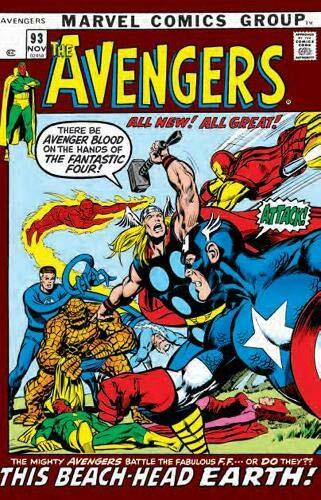 Then, every Avenger from day one returns to battle Ares and the Enchantress. There's no time wasted upping the ante when the mutant-hunting Sentinels return from the heart of the sun. Next, enter: Steve Englehart! The Avengers' new writer doesn't miss a beat as he builds to Marvel's fi rst hero-vs.-hero epic -the Avengers/Defenders War. Also featuring Mantis' first appearance, Magento and the X-Men, and Vision and the Scarlet Witch's growing romance.